Chromosomal translocations, rearrangements involving the exchange of segments between chromosomes, were documented in humans in 1959. 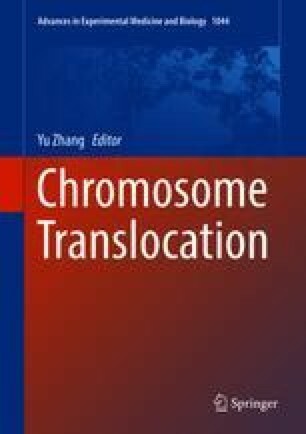 The first accurately reported clinical phenotype resulting from a translocation was that of Down syndrome. In a small percentage of Down syndrome cases, an extra 21q is provided by a Robertsonian translocation chromosome, either occurring de novo or inherited from a phenotypically normal parent with the translocation chromosome and a balanced genome of 45 chromosomes. Balanced translocations, including both Robertsonian and reciprocal translocations, are typically benign, but meiosis in germ cells with balanced translocations may result in meiotic arrest and subsequent infertility, or in unbalanced gametes, with attendant risks of miscarriage and unbalanced progeny. Most reciprocal translocations are unique. A few to several percent of translocations disrupt haploinsufficient genes or their regulatory regions and result in clinical phenotypes. Balanced translocations from patients with clinical phenotypes have been valuable in mapping disease genes and in illuminating cis-regulatory regions. Mapping of discordant mate pairs from long-insert, low-pass genome sequencing now permits efficient and cost-effective discovery and nucleotide-level resolution of rearrangement breakpoints, information that is absolutely necessary for interpreting the etiology of clinical phenotypes in patients with rearrangements. Pathogenic translocations and other balanced chromosomal rearrangements constitute a class of typically highly penetrant mutation that is cryptic to both clinical microarray and exome sequencing. A significant proportion of rearrangements include additional complexity that is not visible by conventional karyotype analysis. Some proportion of patients with negative findings on exome/genome sequencing and clinical microarray will be found to have etiologic balanced rearrangements only discoverable by genome sequencing with analysis pipelines optimized to recover rearrangement breakpoints.